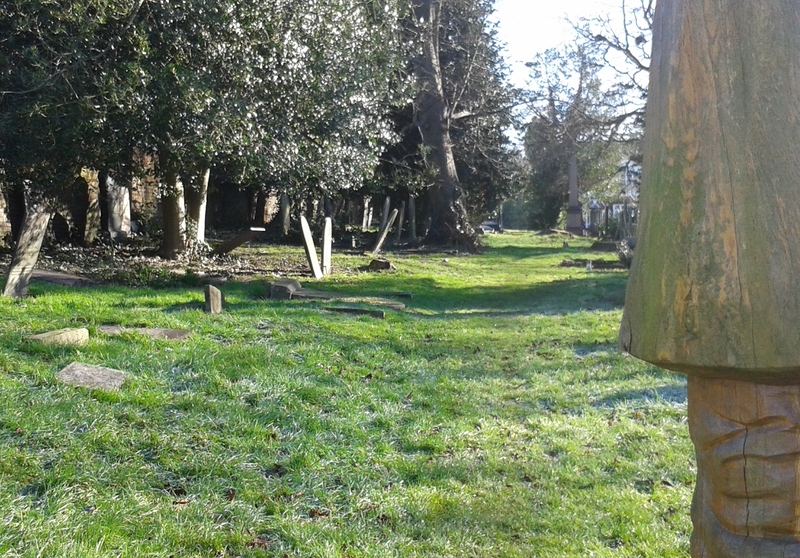 Following Part 1, we are now going to walk along the northern edge of the cemetery to examine the graves there. 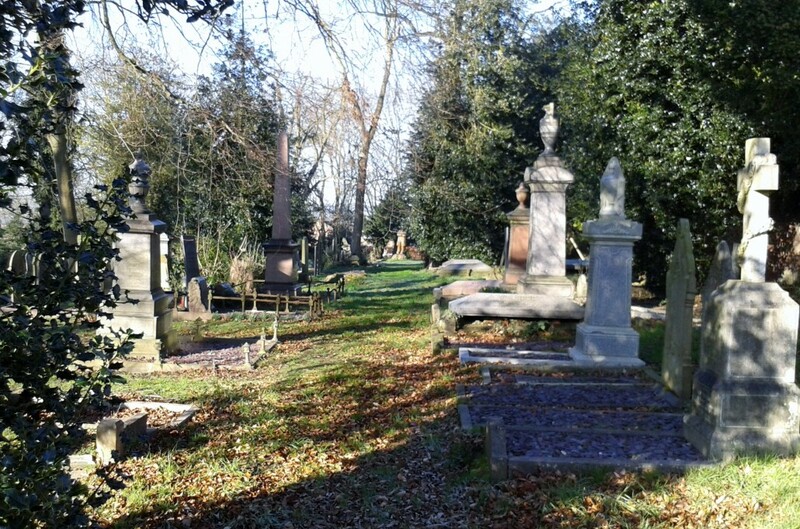 We start in the north-east corner, in the area where once stood the Cemetery Chapel. We will walk along the path you can see before us, concentrating on the graves to the right … and ahead, in the distance, stands Samuel Taylor, waiting for us. Quickly we arrive at the gravestone of members of the Harper family …. 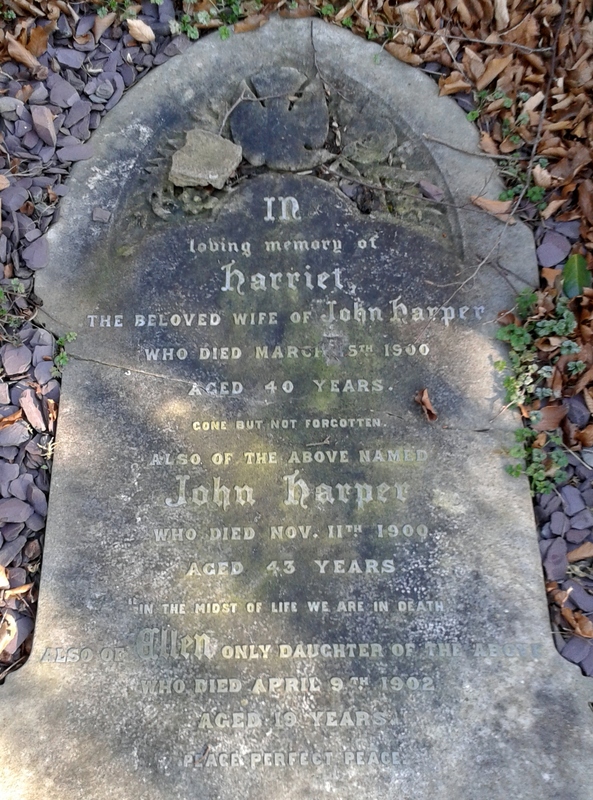 John Harper was born in Cubley, Derbyshire, in 1858, his age at death being registered (correctly?) as 42 … but what is recorded on his stone? Son of canal agent Henry and Elizabeth (nee Bailey), Alexander was baptised at the Independent Chapel in Ilkeston when his birth date was recorded as July 9th 1827. He worked as a framesmith/machine builder, married Maria Tatham, the daughter of Benjamin and Sarah (nee Hardy) on July 11th 1853, at St. Mary’s Church, Ilkeston and was later employed as the manager of Messrs Amos Tatham and Son. In April of 1897, because of his ill health, Alexander was prevailed upon to leave his home in Nottingham Road and ‘try the seaside’ at Scarborough, but he died there a few days later, at the generally agreed age of 69 …. except by those responsible for his memorial. And what of Maria, his wife? She was born on April 13th 1831 (IA 1894) and baptised on May 22nd 1831 at St. Mary’s Church. She died at the family home of Orchard House, 43 Nottingham Road, a few weeks short of her 63rd birthday … thus with a registered age at death of 62. A short distance on is the grave of Maria’s nephew, Herbert Tatham, eldest son of Amos and Eliza (nee Bell), born in Ilkeston on September 25th, 1848 and who died in London on November 23rd, 1882. His gravestone records his age at death as 32 !? Is it possible that the error results because Herbert was baptised in September 1850 ? And nearby — the grave of collier Thomas Edward Roberts, born in Holywell, Flintshire in 1854. He came to Ilkeston in the 1880s and married his second wife, Harriett Spencer, youngest child of Regent Street lacemaker Hillary and Selina (nee Bell), in 1887. Thomas Edward died on March 5th 1908 at his Stanton Road home, when all sources, including the memorial on his gravestone, record his age as 50 …. but was he ?! A few feet further along the path we find the grave of John and Elizabeth Ball who both died in Nottingham where they lived after their marriage (John’s second) in July 1864. Elizabeth was the eldest child of Jedediah Wigley, builder and keeper of Ilkeston’s Market Tavern, and Ruth (nee Ottewell). She was born in Ilkeston and baptised at the Independent Chapel on February 12th 1823, when her birth date was recorded as December 6th 1822. She died on November 5th 1912, at a registered age of 87, though her gravestone shows her age as 88 …. or was she just one month short of her 90th birthday? 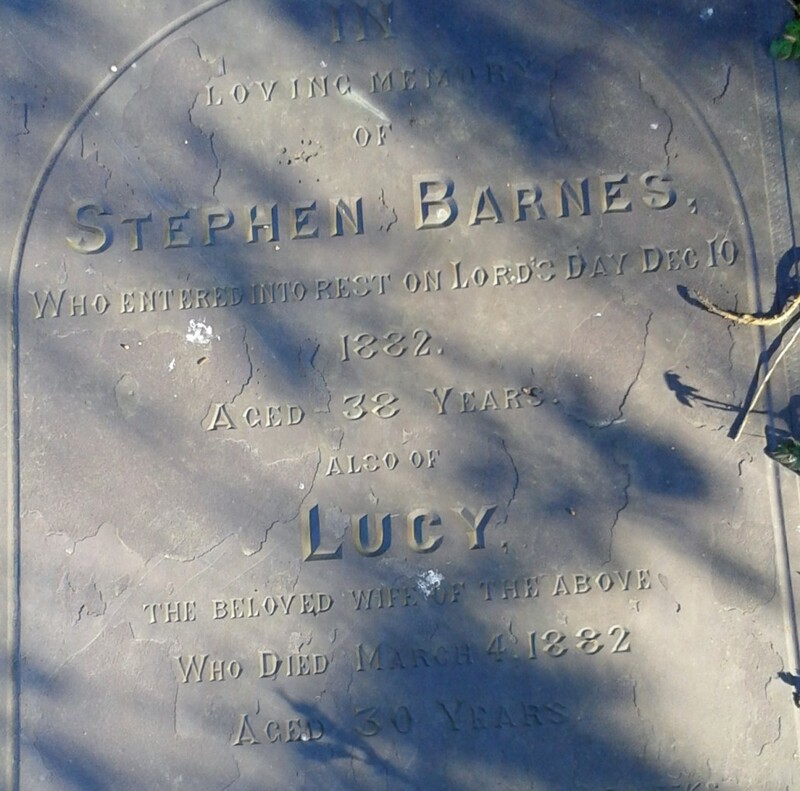 Just a little further and we find the resting place of …..
Stephen Barnes was born at Burton Joyce in Nottinghamshire and baptised there on March 22nd 1845. In the early 1850’s he moved with his family to Ilkeston and later worked as a blacksmith in the Stanton Road area. His wife was Lucy Campbell, eldest daughter of William and Sally Elizabeth (nee Outram), whom he married in March 1881 but who died a year later, from puerperal fever (after the birth of their unnamed daughter on February 18th 1882). Stephen died from meningitis nine months later, his registered age at death being 37 years ….. ?! And on, to the grave of Elizabeth Calladine, wife of Tobias, who died on December 3rd 1874, her stone showing an age of 69. She was the daughter of framework knitter William Harrison and Mary (nee Beardsley), baptised at St Mary’s Church on February 14th 1824, with her birth date recorded as March 2nd 1805. 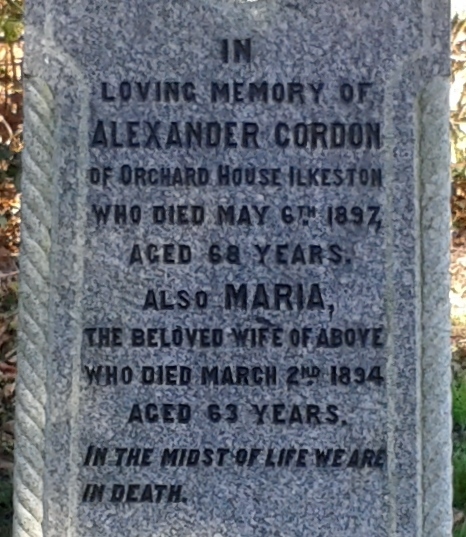 If correct, then her inscription is also accurate … why then is her registered age at death 68 ?! On to Part 3 ?